Dr.Boctor is the owner and founder of St.Catharines Animal Hospital. 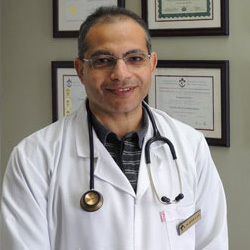 In 2000 Dr. Bassem Boctor and his family decided to immigrate to Canada to pursue their dreams. By 2002, he had successfully completed the North American Veterinary Licensing Examination, the academic part of the National Board Examination. Dr. Boctor worked hard for two years in small and mixed animal hospitals. Here, he successfully met the required Canadian standards in small animal medicine, surgery, radiology, pathology, anesthesiology, equine and food animal medicine. Dr. Boctor has acquired an in-depth and diverse clinical experience by practicing in many hospitals. He passed the Clinical Proficiency Examination from the veterinary medical school at the University of Saskatchewan and became eligible to work as a licensed veterinarian anywhere in Canada. Working in 24-hour emergency hospitals for almost two years, he gained solid experience in both regular and emergency medicine. Following his desire to help people and their pets be more comfortable while accessing quality health care, Dr. Boctor opened his mobile practice in 2006. Due to his hard work with his beloved wife Therese, Dr.Boctor was able to expand from 4 square feet (the size of the trunk of his car), to 3600 square feet, and the business has boomed significantly. Dr.Boctor always loves to go the extra mile to make his patients, clients, and co-workers happy. He has two lovely Shih Tzus at home named Daisy and Leo, that occasionally will come in to visit the clinic. He also enjoys doing all kinds of surgeries, including soft tissue, and oral surgeries while keeping up to date with the latest anesthetic protocols.